Langston was born a free man to a white man who freed his slave and began a relationship with her that last over 25 years, Langston’s mother. After his parents died when he was four years old, he and his siblings moved in with the man his father arranged to be his guardian and began preparatory school at Oberlin College, the first black students to be admitted. After earning a master’s degree in theology he attempted to go to law school, but was denied because of his race. He studied as an apprentice and was admitted to the Ohio bar. He was active in the abolitionist movement, worked with the Underground Railroad, recruited black troops for the Union Army during the Civil War, founded the National Equal Rights League, and was appointed the first dean of the Howard University law department and first president of Virginia State University. He was the first black congressional representative from Virginia, and the last for almost a hundred years after. God who created the world in orderly fashion, your servant John Mercer Langston wielded the power of law to fight for the freedom of his people. Send your spirit to move us to fight for just laws that empower rather than oppress. In Jesus’s name we pray. Amen. Sarah Breedlove was born after the Emancipation Proclamation, and was thus the first person in her family born free instead of a slave. Orphaned at the age of seven, she moved in with family, married, and when her husband died, married another before leaving him. 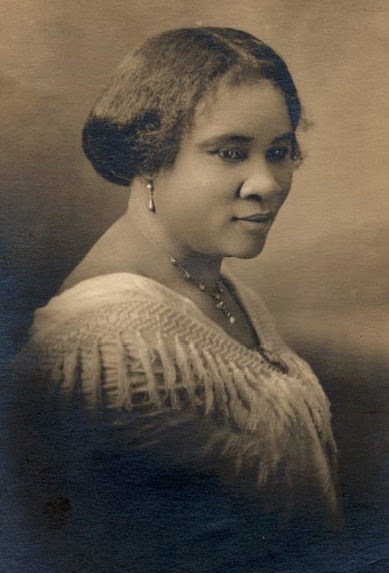 Her third husband, Charles Joseph Walker, is how she took the name Madam C. J. Walker. Like many black women, she suffered skin conditions because of the harsh products used to wash hair and clothing. In response, she developed her own line of beauty products and sold them door to door. She grew that small operation into an empire of factories, beauty schools, and training centers that employed thousands of women, teaching them how to be successful business entrepreneurs themselves. She used her wealth and influence to speak for and fund many organizations in the Civil Rights Movement and her will designated two thirds of her future profits to charity. At the time of her death, she was the wealthiest black woman in America. God of love, your servant Madam C. J. Walker took all that you gave her and used it to bless others. May we use our wealth and our talents not for our own comfort, but for the liberation of others. In the name of your Son, we pray. Amen. Posted on 8 February 2018 by Pastor KenPosted in ChurchTagged black history month, ELCA, Evangelical Lutheran Church in America, John Mercer Langston, Lutheran, Madam C. J. Walker, saints.